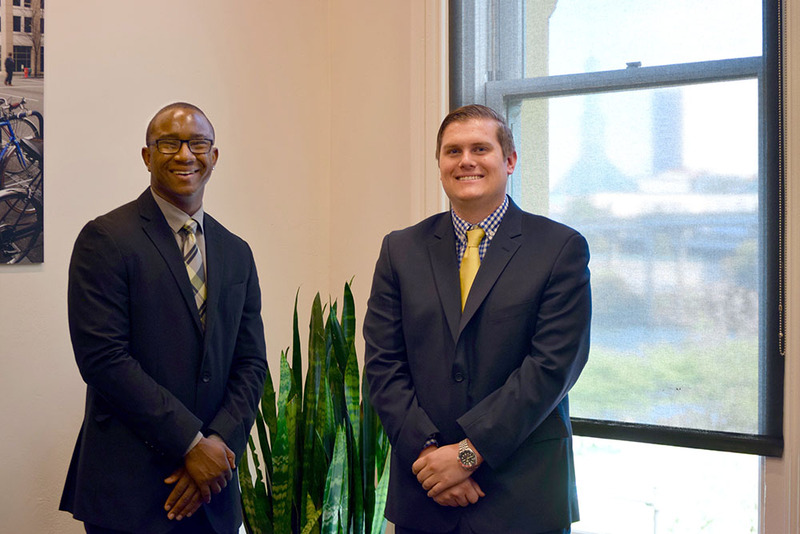 Third-year law students Donovan Bonner and Brent Sutten hadn’t planned on moving to Portland for their final year of law school, but an exciting new opportunity to participate in a year-long paid internship at Bonneville Power Administration caught their eyes and changed their plans. In the past, students at the University of Oregon School of Law typically kept their Portland-based work to a semester or summer at a time in order to fulfill their graduation course requirements through classes in Eugene. Then last fall, the law school added the option for students to take classes in Portland by opening a full-time, Portland-based program for students in their final year of law school. With the increased access to the law school’s Portland-based students, the BPA awarded a five-year renewable contract to UO Law, funding year-long legal internship positions that are full time during the summer and part time during the school year. Bonner and Sutten are the first UO Law students to work in the paid internship, joining other students from Lewis & Clark Law School. The law clerks provide legal research and writing services for attorneys in the BPA Office of General Counsel. Their work exposes them to legal matters across the BPA’s four legal divisions, including power, transmission, natural resources and general matters. The BPA is a federal agency within the U.S. Department of Energy that markets power from 31 federal hydro projects in the Columbia River Basin and other non-federal power plants. It operates and maintains the majority of the high-voltage transmission lines in the Pacific Northwest. Sutten, who came from Maryland for the school’s nationally recognized Environmental Law Program, spent the summer at the BPA working on projects primarily related to natural resources, land-use and tribal law. Bonner decided he wanted more experience in business law and has been working on the corporate side in areas such as employment and contracts. The two students have now transitioned from their 40-hours-a-week summer workload to working part time while taking classes at the new UO Law Portland Program. With the hope of starting their professional law careers in a year, both are also focused on the networking and mentorship opportunities in Portland. As part of the law school’s Portland program, each Portland law student is paired with a local UO Law alumnus or alumna who serves as the student’s mentor for the academic year. “I think the mentorship is awesome. Having that person to talk to or network with is really important,” Bonner said. Sutten wants to practice law in Oregon and sees his final school year as a way to form connections in the legal community.